Students at George Mason University are advocating the termination of Supreme Court Justice Brett Kavanaugh, who is scheduled to teach a George Mason law class in England this summer. 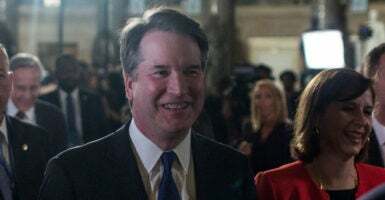 Kavanaugh is currently scheduled to teach the class “Creation of the Constitution” to George Mason University’s Antonin Scalia Law School students in Runnymede, England, where the Magna Carta was signed over 804 years ago, The Washington Post reported Tuesday. Students on George Mason University’s Fairfax, Virginia, campus who say they are survivors of sexual assault are now banding together to protest Kavanaugh’s right to teach at George Mason. Yet another female student said that Kavanaugh’s sexual assault allegations make her too uncomfortable with his presence on campus. “As someone who has survived sexual assault three times, I do not feel comfortable with someone who has sexual assault allegations like walking on campus,” she said, according to The College Fix. A petition to “Support Mason 4 Survivors #CancelKavanaughGMU” has been circulating among students and has gained more than 3,500 signatures. George Mason Democrats, a college club, approved of the petition, the Washington Post reported. Students delivered the petition to the George Mason administration during a protest on April 4. The students marched around campus, some wearing blue tape on their mouths, and defaced a monument, The College Fix reported.